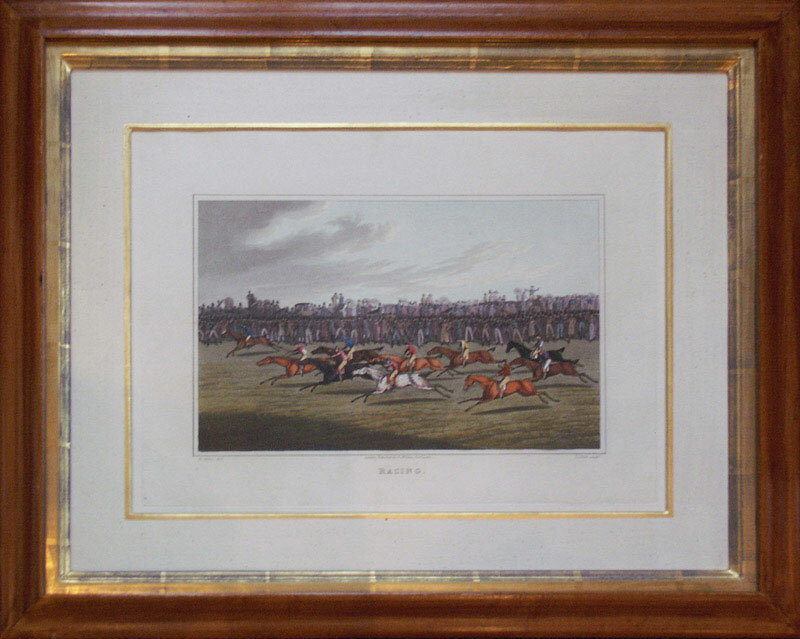 An aquatint engraving with original hand colour, depicting an early racing scene. Engraved by John Clark after the drawings of Henry Alken (1785-1851) and published in the 1821 first edition of Alken’s most famous and ambitious publication National Sports of Great Britain, published in London by Thomas McLean. Henry Alken was the most prolific of sporting artists. He produced paintings, drawings, etchings, aquatints and book illustrations in a seemingly endless stream. His was the age of realism when many artists abandoned the mythological conventions of a previous age and the desire to produce works in the “grand manner” and concentrated on a new form of “pictorial journalism”. Alken was a member of an important family of sporting artists and printmakers: his father Samuel (1756-1815) was a well-known sporting aquatinter, while his son (Samuel) Henry (1810-1896) was mostly known as a painter, many of whose works were engraved by other artists. Framed size: 23 x 19 inches.